Do not go gentle into that good night. 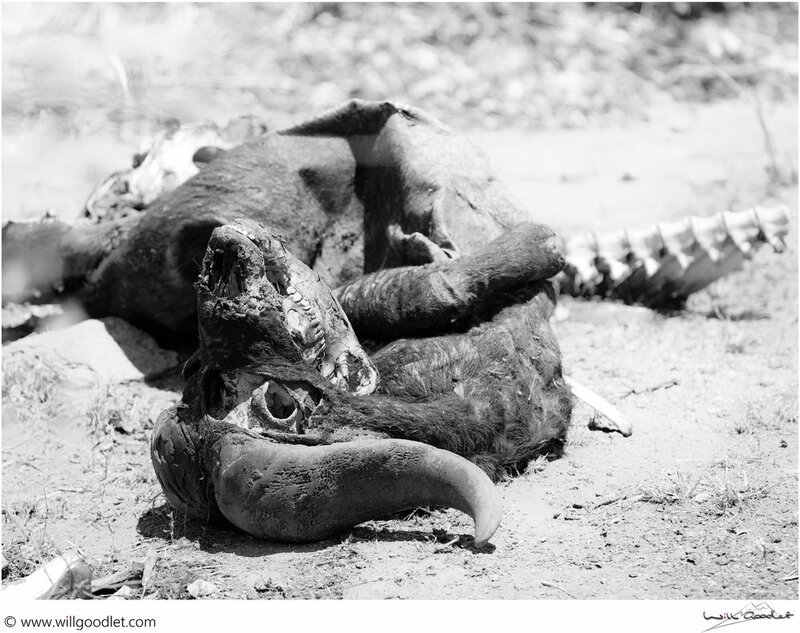 I came across my first dying lion ten or more years ago near Berg-en-dal in the southern Kruger national park. It was a young male, lying inert by the side of the road and barely breathing. I’d never seen anything like this before, his emaciated body looked decimated by disease with his ribs barely lifting. I couldn’t see any sign of injury, and decided that he had some kind of wasting disease..
Emaciated and sick, this male lion is clinging on to life. When I got home, I did some research and discovered that there are two wasting diseases prevalent in southern Kruger but that this one was most likely to be Bovine Tuberculosis. Bovine TB in lions was discovered in the Kruger population in 1995 when two wasted and dead females were post-mortemed. It caused a sensation at the time because the disease had not been seen in wild lions before this time. The disease is caused by the Mycobacterium bovis bacterium which is generally carried by a host or maintenance species. In this case, it is the Cape buffalo. Cape buffalo became infected with the disease from contact with cattle. With the Cape buffalo being one of the staples of the lion food supply, it wasn’t long before the disease started to take its toll on the lions of the region, particularly when it is considered that weaker, infected buffalo, might be naturally selected and predated upon. In buffalo the disease tends to take much longer before the animal weakens and shows signs of the infection, while in lions the effects tend to show up between 2 and 5 years after infection. Due to the location of the bulk of the bacterium in the buffalo’s lungs and windpipe, it’s often the hunting age lions and adult, dominant males that become infected first. Male lion dying from disease. The reason for this is because the buffalo is typically killed by suffocation at the throat, where the bacterium may enter a lions mouth. The large males will also take the choicest pieces of the carcass - one of these is the lungs, a major source of infection. It is estimated that as many as 54% of the southern Kruger lions are infected with Bovine TB with relatively fewer infections in the north of the park. Populations have also been infected in other parks, like Hluhluwe. Many of the infected buffalo reside in the southern part of Kruger, so it is easy to understand why the lions there have been affected more. According to scienceinafrica.com the most recent testing revealed 80% of lions in southern Kruger had been exposed to the bacterium but only some of these show symptoms at any one time. The research undertaken at the University of Minnesota Supercomputing Institute using a parameterised model indicates that although the rate of infection is high, the overall lion population is estimated to fall by only 3%. It also indicated that transmission between lions was negligible and that it is mainly from buffalo that lions become infected. Two other contributing factors were also identified, drought and other immune deficiency diseases (e.g. Feline AIDS). In terms of the overall population of lions, this study represented fairly good news, as it is unlikely that the population will fall dramatically. The major hope for preventing the further spread of the disease remains a vaccine. Although, vaccinating the wildlife in Kruger is unlikely to be a task that will ever be successful, it does mean that livestock could be less threatened and that the disease spreads less rapidly into central Africa as a result. Due to the complex social structure amongst lions, the illness and death of the leading members of the pride can have devastating consequences for the other members. TB has an impact beyond just the infected lions. With most of the prides in Kruger being protected by a coalition of two or more males (usually related), the death of these individuals can mean upheaval and death for the remaining members as new males take over, typically killing the cubs. The shortened tenure of the males in charge of the pride will mean that only a couple of generations of cubs will be unaffected by changes at the top. In studies, it has been shown that the prides in the northern regions, with longer tenures, have more time to raise young. South African national parks has undertaken studies to determine the impact of the disease and ways to manage its spread. While TB has been found in a number of wild populations there are no examples where TB has had a major impact on the populations. However, one of the concerns is the spread of the disease since it was detected. More recently, there has been focus on the rhino population. Captive rhinos have been found to be susceptible to the disease but more recently a free-ranging black rhino female was found to be suffering from it; perhaps, unsurprising given the prevalence of the disease in southern Kruger. With Kruger pulling in tourists from all over South Africa and the rest of the world, the loss of the lion and potentially other big cats would be an economic and natural disaster. While, this is unlikely to happen, tourists will continue to see sick and dying lions when they visit. There appears to be little acknowledgment or literature (that I have seen) that explains these sightings to tourists, so perhaps it is important to reassure visitors. Bovine TB does not just affect buffalo and lion, it has also been found in domestic animals, leopard, cheetah, hyena, kudu, genets, impala, rhino and warthog. This diversity of hosts presents a significant challenge when trying to prevent its spread. A day later, a Hyena carries its' brutal trophy. Do you recognise it?